Toners and astringents are products used to improve the surface of your skin. Toners help to remove any traces of oil, perspiration or makeup from your skin. An astringent, however, may be alcohol- or chemically-based and is used to clean the skin and close pores. The differences between astringents and toners have to do with their components, effects and the skin type indicated for use. 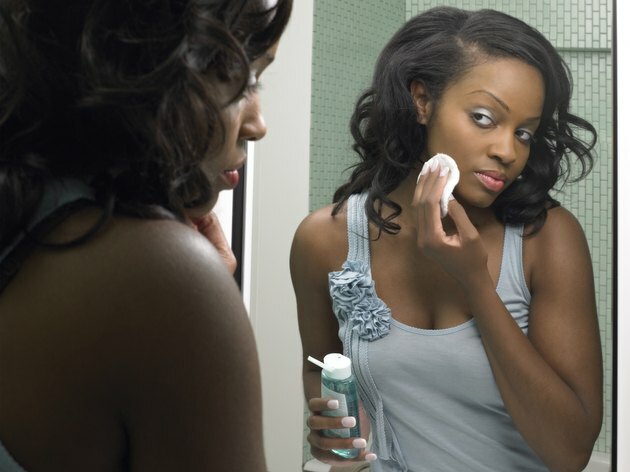 A good skin-care routine begins with cleansing the skin, which helps to rid it of dirt and oils. Next, dependent upon a person's skin type and desired result, a toner or astringent is applied using a cotton pad or cotton ball swiped gently across the skin. Because cleansing the skin can leave a residue, a toner or astringent helps to remove this residue prior to applying moisturizer. Toners tend to be the milder than astringents, according to the Whole Living website. Toners typically contain natural ingredients, such as waters steeped with flowers and/or herbal extracts. Examples of this include rosewater, aloe extract or chamomile. Astringents are made of alcohol-based products, such as witch hazel. If you have sensitive skin, use a toner. As toners tend to be less drying or potentially irritating to the skin. Astringents work best on normal, oily or non-sensitive skin types. Because astringents contain alcohol or witch hazel -- both of which can be drying to the skin -- these should be used only on skin that has excess amounts of moisture. While some effects, such as removing the film left over from cleansing, are shared by toner and astringent, each offers slight differences. For example, toners can keep the skin hydrated and may contain herbal ingredients, such as citrus fruits, that reduce the amount of free radicals on the skin. Toners also are slightly acidic. They help to restore pH balance to the skin, and can help to reduce breakouts. Astringents may have a diminishing effect on the skin's pores, which creates a tingling sensation on the skin. Regardless of the type chosen, it's important to gently sweep the toner-soaked cotton ball/pad across the skin. Some users make numerous swipes over the skin, which can leave the skin feeling dry and negatively alter the pH balance of the skin. Also, if your skin shows signs of irritation following toner or astringent application, you should use less toner or astringent. It's best to switch to a milder toner or astringent; or cease use altogether.